InterOcean Advisors LLC (“InterOcean”) announced today that Precise Structural Products (“Precise Structural”), a business unit of L.B. 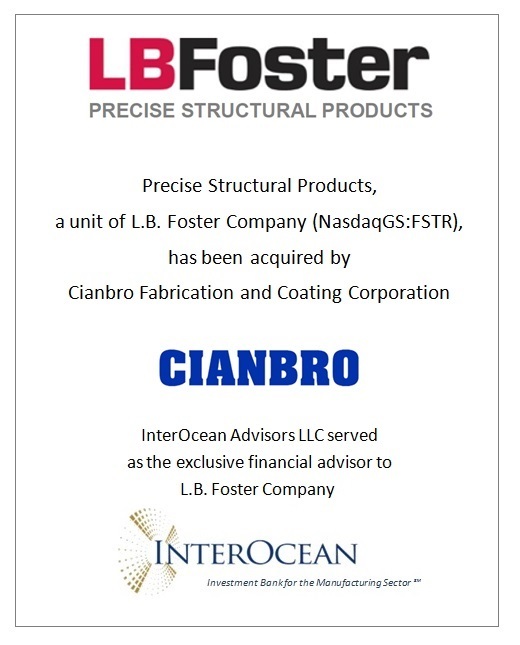 Foster Company (NasdaqGS:FSTR), has been acquired by Cianbro Fabrication and Coating Corporation (“Cianbro”), a subsidiary of The Cianbro Companies and a provider of heavy industrial, civil construction and construction management services based in Pittsfield, Maine. InterOcean served as the exclusive financial advisor to L.B. Foster Company. Precise Structural is engaged in manufacturing fabricated steel products for the highway, bridge, transit and construction markets. It provides custom fabrication and related services including welding, sawing, cambering, blasting and painting. Precise Structural is headquartered in Georgetown, Massachusetts. “This transaction is truly a win-win for L.B. Foster Company and Cianbro. It provides Cianbro with a fabrication facility strategically located between New York City and Boston and allows Cianbro to expand its product line to include “stringer bridges”. Plus, the transaction enables L.B. Foster to further focus on its market-leading line of construction products”, stated Bob Wujtowicz, a Managing Director at InterOcean.